On October 29, 2007, our city had the honor of hosting representatives from our future Sister City: Zapopan, Jalisco. Dra. Patricia E. Malfavón, International Affairs and Sister Cities Coordinator for Zapopan and Lic. Maria del Carmen Mendoza, Comptroller for the State of Jalisco, visited several tourist spots in Grand Rapids and met with City leaders to exchange ideas for future collaboration. “We are much exited to be here. On behalf of Sr. Juan Sánchez Aldana Ramírez, Mayor of Zapopan, we want to thank everyone for your gracious hospitality and want to deliver a message of commitment to work in developing projects for our sister city relationship”, expressed Dra. Patricia Malfavón. “We are working in several areas to develop cultural, economic technological and social projects”. According to Dra. Malfavón, Zapopan has a very diverse economy with an emphasis in technology, culture and education “There are 13 internationally recognized Universities in Zapopan, with student exchange programs all over the world. 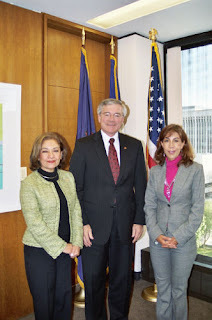 Our objective is to increase this number with rand Rapids and Zapopan; this is just one of the topics we explored with the Grand Rapids Mayor, George Heartwell, who, by the way, is a very amiable person and very committed”. As for technology, “we have are recipients of heavy investments from multinational corporations, most of them focused in Information Technology”, Dra. Malfavón added. “Tourism is also very important for us. In Zapopan, we have the largest Convention Center in Latin America, home of many international exhibits and expos. Ours is a very strong municipality, we are part of the metropolitan area of Guadalajara, and 60% of our population is of young people”. Although Dra. Malfavón considered Grand Rapids a modern city, she finds many similarities between cities, she stressed that “we share the same objectives towards the future; this will allow us to work together, in projects for growth and opportunities for our citizens”. Finally, Dra. Malfavón expressed that this visit had impressed her “it was a great experience, one that we will share with our Mayor and, of course, with President Calderon, whose administration is very much focused in internationalization; here his words: México en el Mundo…“Dear people of Grand Rapids, we wait for you with open arms, we will support you in any way we can… Zapopanos in Grand Rapids, we would love for your children to know their culture and to get involved in many of the projects that will develop from this marvelous relationship”. Rapids Community College, Vicente Sánchez Ventura, Consul of Mexico, Luis García, IME Councilperson for Michigan; representatives of Grand Valley State University; they also visited the Grand Rapids Art Museum, the Meijer Gardens, and of course, the West Michigan Hispanic Chamber of Commerce Expo. It is important to mention that this visit was made possible thanks to the excellent coordination of the Sister Cities-Mexico Committee; and its President Arturo Armijo, who plans to have the official signing ceremony on June, 2008.